Robot Moonwalk is a new and improved playground that is sure to keep them entertained, along with a counting game that matches images with numbers. Great for children of all ages!! 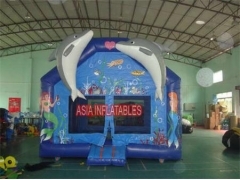 Printing Inflatable Dolphin Bouncer is suitable for outdoor, family and playing center uses. It is made of high quality 0.55mm PVC tarpaulin and is of non-toxic. With a technical design, you needn't worry about the problem of safe. It is a good choice for weekends and holidays. 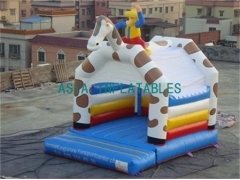 Our 16 Foot Inflatable Clown Jumping Castle is one of our best looking bounce houses. This happens to be our newest and may be our funnest! A lot of space inside this bounce house that even has a slide and obstacle courses inside of it! The perfect jumping bounce house for any tropical themed party! Give us a call or Contact us with any questions you have! Our Go Hunting Inflatable Bouncer/Inflatable Moonwalk Castle is one of our best looking bounce houses. This happens to be our newest and may be our funnest! A lot of space inside this bounce house that even has a slide and obstacle courses inside of it! 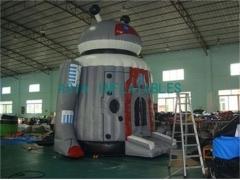 The perfect jumping bounce house for any themed party! Our Inflatable Tiger Belly Bouncer for Rental Business is one of our best looking bounce houses. This happens to be our newest and may be our funnest! A lot of space inside this bounce house that even has a slide and obstacle courses inside of it! The perfect jumping bounce house for any party! 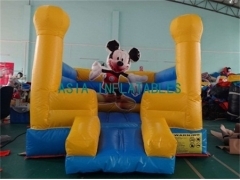 This Disney Mickey Mouse Jumper is one of our best looking bounce houses. This happens to be our newest and may be our funnest! A lot of space inside this bounce house that even has a basketball hoop inside of it! The perfect bounce house for any tropical themed party! 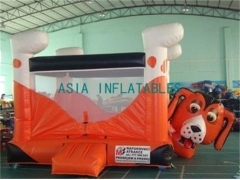 Newest Inflatable Tiger Bouncer is suitable for outdoor, family and playing center uses. It is made by high quality 0.55mm PVC tarpaulin and is of non-toxic. With a technical design, you needn't worry about the problem of safe. It is a good choice for weekends and holidays. Hippo Slide, Giant Inflatable Hippo Slide, 53m Giant Inflatable Hippo Slide can be used indoor or outdoor for Business Rentals. It is Easy set up and deflate. OEM/ODM is welcome. High Quality, Wholesale Price, Timely Delivery! Hippo Slide, Giant Inflatable Hippo Slide, 30m Giant Inflatable Hippo Slide can be used indoor or outdoor for Business Rentals. It is Easy set up and deflate. OEM/ODM is welcome. High Quality, Wholesale Price, Timely Delivery! This Unit Palm Trees Roaring River Inflatable Water Slide is suitable for outdoor, family and playing center uses. It is made of high quality 0.55mm PVC tarpaulin and is of non-toxic. With a technical design, you don't worry about the problem of safe. It is a good choice for weekends and holidays. Dual Lane Slip N Slide Inflatable Water Slide, Double Lane water slide bring rider ultimate water fun and it allow two player to pplay at the same time. With a high speed and dip into the water pool! Cool off by the water in the pool, summer is not hot at all! 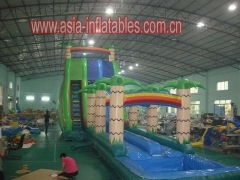 This Unit Giant Inflatable Tropical Dual Water Slide is suitable for outdoor, family and playing center uses. It is made of high quality 0.55mm PVC tarpaulin and is of non-toxic. With a technical design, you needn't worry about the problem of safe. It is a good choice for weekends and holidays. New 27' Tropical slip n slide combo features a radical sliding angle that's sure to get the adrenaline pumping as riders scream down the Tropical Slide. At the bottom, riders continue down 26' of additional sliding fun before landing in the splash down pool. This combo water slide will blow your mind! 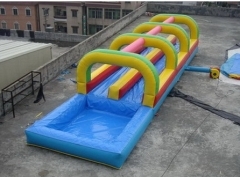 You have various choice for inflatable wet / water slides, such as Wild Rapids Water Slide, Palm Tree slide, Tropical Super Splash Down, Monster Wave Slide, Roaring River Water Slide, Corkscrew Water Slide, Slip N Slide, etc. It is thrilling to slide down from high in a high speed and splash youself into the water pool. Perfect for party, event and flexible used in sand beach, water park, house backyard, hotel swimming pool and resort. Doubel Drop Water Slide, Doubel Drop Dolphin Wave Water Slide bring rider ultimate water fun and it allow two player to play at the same time. With a high speed and dip into the water pool! Cool off by the water in the pool, summer is not hot at all! 18 Foot Triple Lane Wave Water Slide bring rider ultimate water fun and it allow two player to play at the same time. With a high speed and dip into the water pool! Cool off by the water in the pool, summer is not hot at all! Commercial use quality in facctory price, timely delivery! 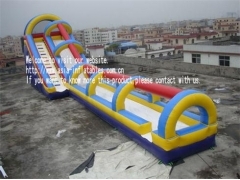 This Module Bounce Water Slide Inflatable Combo bring rider ultimate water fun and it allow two player to play at the same time. With a high speed and dip into the water pool! Cool off by the water in the pool, summer is not hot at all! Commercial use quality in facctory price, Durable for 3-4 years. Module Bounce Water Slide Inflatable Combo bring rider ultimate water fun and it allow two player to play at the same time. With a high speed and dip into the water pool! Cool off by the water in the pool, summer is not hot at all! Inflatable Whale Water Slide bring rider ultimate water fun and it allow two player to play at the same time. With a high speed and dip into the water pool! Cool off by the water in the pool, summer is not hot at all! Best Quality, Wholesale Price, Quick Shipping! Splash Down Water Slide. We have very cool water slide games in various styles for kids and for adults. For a couple of hours, players could have a wonderful time play with friends and that is ultimate slide and water fun! Splash Down Inflatable Water Slide bring rider ultimate water fun and it allow two player to play at the same time. With a high speed and dip into the water pool! Cool off by the water in the pool, summer is not hot at all! Dual Lane Water Slide. Slip N Slide. This Colorful Dual Lane Slip N Slide bring rider ultimate water fun and it allow two player to play at the same time. With a high speed and dip into the water pool! Cool off by the water in the pool, summer is not hot at all! This Dual Lane Slip N Slide bring rider ultimate water fun and it allow two player to play at the same time. With a high speed and dip into the water pool! Cool off by the water in the pool, summer is not hot at all! High Quality, Wholesale Price, Timely Delivery! 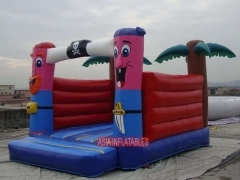 This Kids Inflatable Water Slide bring rider ultimate water fun and it allow two player to play at the same time. With a high speed and dip into the water pool! Cool off by the water in the pool, summer is not hot at all! Bounce Water Slide Inflatable Combo bring rider ultimate water fun and it allow two player to play at the same time. With a high speed and dip into the water pool! Cool off by the water in the pool, summer is not hot at all! Dual Lane Water Slide, Inflatable Tropical Water Slide, Dura Lane Slip n Slide bring rider ultimate water fun and it allow two player to play at the same time. With a high speed and dip into the water pool! Cool off by the water in the pool, summer is not hot at all! Dual Lane Slip n Slide Inflatable Rainbow Water Slide, Dura Lane Slip n Slide bring rider ultimate water fun and it allow two player to play at the same time. With a high speed and dip into the water pool! Cool off by the water in the pool, summer is not hot at all! Dual Lane Inflatable Roaring River Water Slide bring rider ultimate water fun and it allow two player to play at the same time. With a high speed and dip into the water pool! Cool off by the water in the pool, summer is not hot at all! Splash Down Dual Lane Inflatable Wave Water Slide, Double Lane water slide bring rider ultimate water fun and it allow two player to play at the same time. With a high speed and dip into the water pool! Cool off by the water in the pool, summer is not hot at all! Rainbow Inflatable Curved Water Slide, there is a rock climbing ramp on the back which make it little challenge for kids. But it is exciting and thrilling to slide down into the splash water from high. Summer is cool if you have a water game like this to play. Giant Inflatable Curved Water Slide, This Curved water slide decorated with palm trees and the dophins model, and the 22 Foot height create a high speed for rider when splash into the water pool. A extreme water fun game for kids in hot summer day. Super Inflatable Tropical Water Slide, This tropical water slide decorated with palm trees, and the 8.3m height create a high speed for rider when splash into the water pool. A extreme water fun game for kids in hot summer day. High Quality, Timely Delivery! 24 Foot Inflatable Mega Water Slide With Pool, This mega water slide decorated with palm tree and dophin model, and the 8.5m height create a high speed for rider when splash into the water pool. A extreme water fun game for kids in hot summer day. 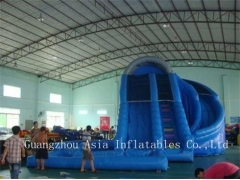 Inflatable Double Drop Water Slide, there is a rock climbing ramp on the back which make it little challenge for kids. But it is exciting and thrilling to slide down into the splash water from high. Summer is cool if you have a water game like this to play. This Super Splashdown Water Slide is as exciting as it is beautiful. Ride this 18 foot wave with the dolphins. This is a steep water slide that makes it thrilling for all ages. Reserve the Super Splashdown slide now for any theme Party Rentals.